At the Village Green Nursing Home, Selby on Saturday December 30, 2017, in her 95th year. Beloved wife of the late Wilfred Tompkins (1971) and the late Merle Kennedy (1995). Dear mother of Harold Tompkins (Leslie McNaughton), Ottawa; Howard Tompkins, deceased and her late infant daughter Donna Marie. 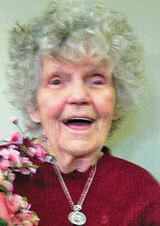 Sadly missed by her grandchildren Stephanie Tompkins, Brockville and Duane Tompkins, Brockville. Survived by her brothers Clarence Lennox, Niagara Falls and Russell Lennox, Nanaimo. Predeceased by siblings Lloyd, Everett, Archie, Cecil, Bessie White, Edna Tompkins and Bertha. The family received friends at the Wartman Funeral Home “Napanee Chapel” on Thursday from 12noon-1pm followed by a Funeral Service at 1pm. Interment Bath United Church Cemetery. In lieu of flowers, donations to the Mourning Star Mission Food Bank would be appreciated.